Eliminate the Chaos and Danger of Tangled Cables and Tubes! Medical lines are connected to patients for many purposes - delivering medications, gases and internal feedings for example. How many times have you seen these cables tangled, creating dangers for patients and staff alike? 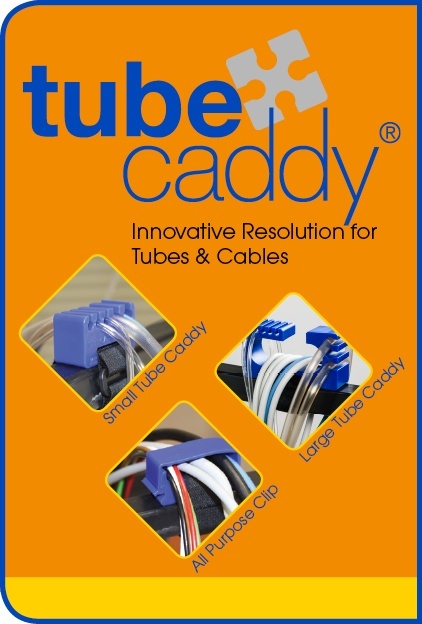 With TubeCaddy®, eliminate the chaos and danger of tangled cables and tubes! Can be used in every area of the hospital. TubeCaddy® cleans and disinfects easily! Want to keep your hospital rooms more organized and safer? Contact us to learn more about our TubeCaddy® organization solution for medical lines, cables and cords. Accommodates 3 IV's and 2 suction tubes, meeting the needs of most hospital units.